Talofa Samoa! Over the past few months this column has printed testimonies of people that followed the whole food, plant based (W.F.P.B.) diet and in a matter of weeks turned around (or as we say ‘reversed’) their Type 2 diabetes. Not just the diabetic condition itself but also its dreaded complications like loss of vision and draining leg or foot wounds that could have led to amputation. All this allows us to say loud and clear: diabetes and its complications can be reversed: Even at the stage where complications have set in. All this of course on one condition: that one strictly follows the W.F.P.B. diet, which means staying away from animal products and oil. By presenting this good news in this column we are simply informing the public what has been reported in medical scientific journals for the past several years. For example, in a 2011 article in the scientific journal Diabetologia, British researchers concluded that diabetic patients should know that they have ‘a potentially reversible condition and not one that is inevitably progressive’. Something drastic must be done to prevent more and more diabetics to end up needing dialysis. Let us review how diabetics end up with renal failure. Most Samoans now consuming the Western animal-based diet eat large amounts of animal proteins. Once the body’s needs for protein are met, then the excess must be removed. The liver converts the excess protein into urea and other nitrogen-containing breakdown products, which are finally eliminated through the kidneys as part of the urine. All this puts a heavy burden on the kidneys. It leads to chronic inflammation and eventual scarring of the delicate kidney tissues and gradual loss of kidney function. In a research project reported in one of the reputed medical journals, Harvard University researchers in the USA tracked the kidney function of a large number of women that had already some loss of kidney function: they found that the more animal protein the women consumed the more kidney function they lost. Patients are told to go on dialysis because their kidneys are not able anymore to clear the waste products out of their blood and therefore a machine has to do it – about three times a week. It is our experience that if such patients follow strictly the WFPB diet from the moment they are told their kidneys start to fail, kidney function can be restored just enough to prevent the need for dialysis. Indeed, the plant-based diet allows some of the tiny blood vessels that make up the filtering units in the kidneys to recover, making the filtering units operational again. We applaud the National Kidney Foundation (NKF)’s programme of diabetic disease detection and look forward to a collaboration between the NKF and METI to help guide diabetics on the path of recovery by adopting the WFPB diet that ultimately will lead to a reversal of their medical condition and shield them from having to be dialysed for the rest of their life. By informing all diabetics about the value of following the WFPB diet, early enough in the course of their disease, they can avoid the dreaded complications not only of renal failure but also of vision or limb loss. What the first scientific article mentioned suggests is that all diabetic patients should be made aware that they have a reversible condition and not one that is incurable. Instead of a ‘message of doom’ (“there is no cure for Type 2 diabetes”) that the doctors unfortunately have had to announce to the patients for so many years, they can now offer a ‘message of hope’ (“Type 2 diabetes can be reversed – and even Type 1 diabetes can better be managed”). To demonstrate how powerful and effective the WFPB diet is in reversing the various non-communicable diseases, we print today the testimony of Nikolao Patu, a 62 year old farmer from Vaoala. In his own words, he reports on his recovery not only from Type 2 diabetes but also high blood pressure and heart disease so severe that he had to undergo cardiac bypass surgery. By strictly following the WFPB diet he reversed the three medical conditions that had crippled him for years. He is now able again to look after his taro plantation and enjoy his new found health. If any of you reading this page want to know more about the WFPB diet, come visit METI’s Clinic at Motootua and register to attend the weekly Health Seminar –in Samoan or English- and the Cooking demonstration. You can reach us at 7636358 or 7239297 during working hours, 8 am to 4 pm, Monday to Friday. 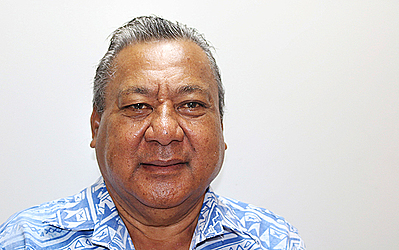 I am NikolaoPatū, a 64 year old father from the village of Moamoa. I became Diabetic in 2000, and was started on drugs. In 2008, I developed Hypertension and needed additional pills. In June 2016 my family took me to the Emergency Room at Motootua Hospital. I thought my blood sugar had gone up, but the Doctor said I suffered a Heart Attack and also warned me that I was on the verge of getting a stroke. I was admitted to the Hospital for treatment and discharged. In July 2016, the Doctors called me to come and I was checked for my heart by the Specialist from NZ, who had just arrived. The Doctor took a scan and told me to come over to NZ for a Bypass operation. In November 2016, I travelled to NZ, and one month later had that special operation for my heart. After that I came back to Samoa with additional pills. When I arrived home I was checked every two months until one day in September 2017 I had another emergency; I was bleeding, and I needed 4 pints of blood. The Doctor stopped all my pills because they suspected the cause of this bleeding was related to the pills I was taking for the heart. Then they found out I had an ulcer and they added other pills for ulcer. In October 2017 the Doctor told me I must go to METI because I was using so many pills. On that day I went straight down to the old Acute Seven where the METI Clinic is located and asked for help. I attended on Wednesday on that same week their Health Seminar and started the whole foods, plant based diet. After the first two weeks I felt different: I felt my body lighter and also the first time my blood sugar and blood pressure came down. On the 26th of October, Dr Vermeulen stopped all my medication. Starting from that time until now I am free from drugs. More than ten years, I got these degenerative diseases; I just stayed home and stopped doing any more work, even driving my car. But, plenty of good changes happened in my body since I have been on this diet. Now I’m back to my normal duties, doing my plantation work, attending the church meetings and also I am now driving my car again and a lot of things I am busy with at home. I’m still going for my special check-up for my heart; but my sugar level and blood pressure have now become normal. I now say thanks to my whole family, my lovely wife and the kids for their full support. Special thanks to METI for the great work they have done for me. I love this diet: the Whole Foods Plant Based Nutrition. It’s not hard to follow this diet; you don’t die from eating only vegetables but you do get sick and die because of eating these animal products. “If there is a will there is a way”.